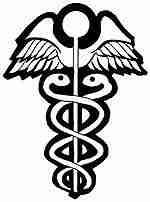 Caduceus 1 : the symbolic staff of a herald; specifically: a representation of a staff with two entwined snakes and two wings at the top. This symbol is related to Hermes, messenger to the gods. It is said Hermes put his staff between 2 fighting snakes. The snakes represent wisdom and knowledge, or art and science, and this symbol is used by the animal and human medical professions. It is a beautiful symbol, the winged power of Hermes steed, Pegasus, and the necessarily entwined wisdom and knowledge, merged together. Your ability to care for your reptile pet also requires your wisdom and knowledge: a commitment to learning about the specie, providing nutritious foods or various otc antibiotics, a proper habitat, and observing the normal behavior of your pet. If you know how to take care of your reptile and know how he or she acts when healthy, you'll be better equipped to spot different behavior in your pet. If you can spot the signs of illness, you and your veterinarian can treat your pet! View our list of Recommended Reptile Veterinarians.